Jordi Turull, the Catalan pro-independence leader in pre-trial detention for nearly a year, has urged people to avoid violence during protests planned against a Spanish government meeting in Barcelona on Friday. ‘I would not like it if people, with their faces covered, demanded my freedom,’ Turull, a former spokesman for the Catalan regional government, told the AFP news agency from behind a glass screen at the Lledoners prison some 60km north of Barcelona. ‘We have to do as we have always done, which is to protest peacefully,’ added Turull, who has been on a hunger strike for 17 days. He is one of nine Catalan pro-independence leaders awaiting trial in jail over Catalonia’s failed independence bid last year. 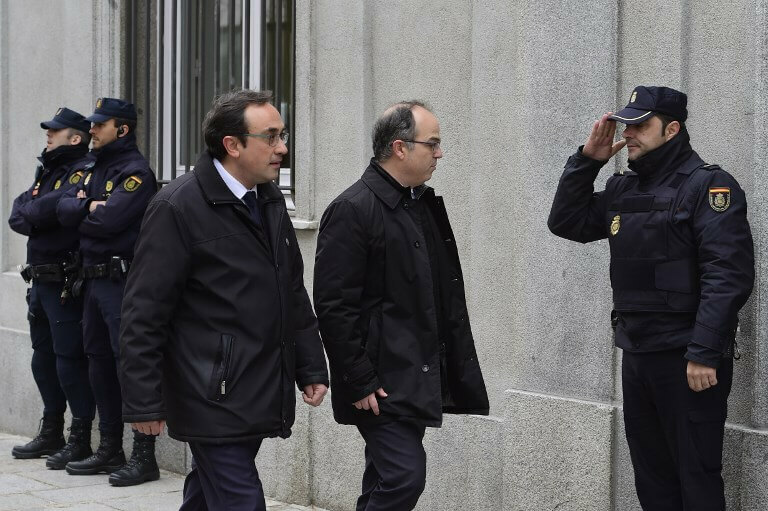 The trial is likely to start in early 2019 – more than a year after Catalan leaders in the northeastern region attempted to break away from Spain in October 2017 by staging a referendum despite a court ban, and then proclaiming independence to no avail. 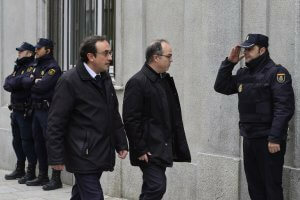 Spain’s Supreme Court held a preliminary hearing on Wednesday to decide on its competence to hear the case. Turull has shed seven kilos (15 pounds) since he started a hunger strike on 1 December. Last week he was transferred to the prison’s infirmary. ‘I don’t like some of the images I have seen,’ he said, citing a demonstration in the city of Girona on December in which 15 police officers were injured as an example. ‘This is not our way of doing things,’ Turull said. Similar scenes could play out again this Friday 21 December, when Spanish Prime Minister Pedro Sánchez holds a cabinet meeting in Barcelona, the capital of Catalonia which is split over the issue of independence. Pro-independence groups have called on their supporters to take to the streets to protest against the meeting, which coincides with the one-year anniversary of snap polls in Catalonia called by Spain’s central government after the region unsuccessfully declared independence. Pro-independence parties once again won an absolute majority in the Catalan parliament in the election, even though many candidates were in jail or self-imposed exiled over their role in the failed independence bid. ‘Over ten percent of lawmakers elected that day are in jail or in exile. To come on that day is a provocation,’ said Turull. He began his hunger strike on 1 December along with another jailed Catalan leader, Jordi Sànchez, the former head of grassroots pro-independence group, the Catalan National Assembly (ANC), to protest what they say was a Constitutional Court block of their attempted appeal to the European Court of Human Rights (ECHR) against their provisional detention. They were joined by two more Catalan leaders, Joaquim Forn and Josep Rull, at the Lledoners prison two days later. ‘We saw that there was a coordinated action to not allow us to go before European justice … You reach a moment when you have to shake things up because this is normalising a violation of rights,’ said Turull. He said the hardest part of the hunger strike was the ‘psychological aspect’. ‘I dream of a tuna can,’ Turull said, adding that while the hunger strike is open-ended, he promised his family that he would not put his life at risk. Turull said he wants to ‘be strong’ for his trial. ‘I look forward to going and showing that the charges are a fabrication,’ he said.